WOW!!! What a crazy few days I have had! I started these pumpkins last week, and was hoping to post them a few days ago, but they have been the cause of 2 (yes TWO!) ER visits! I instantly fell in love and thought, I can make those! I bought them to duplicate (shhhh...don't tell, I still have to return them) $3.99 each! I raided my scrap wood bin, then free handed the pumpkins on the wood. I then took my DREMEL with a drum sander bit on the end and gouged the edges and rounded details. See the difference? Next I painted them black (not completely) just where the crackle would go. I am lovin' the results! I free handed the damask designs on with pencil (I copied the ones on the HL pumpkins) and I also copied some damask designs from some scrap book paper I had. This is where ER visit #1 comes in to play! So I am just about done painting the damask designs when my little one year old, Josh, bangs his head on the bar stool I am sitting on! (you know how they like to play at mom's feet at all times) I pick him up and see this instant bump right between his eyes with a pretty deep cut. I rushed him to the instacare by my house, and they said I needed to take him to Primary's in downtown SLC. So we head down there, and wait 5 hours to get two stitches. He was such a trooper! He laughed and smiled most of the time! He loved the slurpy they gave to wake him up! Red crayon bandaids are the best! We were both exhausted by the time we got back, so I decided to finish the pumpkins the next day. So this morning (the very next day) when I laid Josh down for a nap, I decided I could FINALLY finish the pumpkins. I finish the paint from yesterday, sand the edges up a bit, then it is time to stain. Being good I go out on my porch to stain the pumpkins. There are only 6 of them, so I figured it would take about 5 mins. I am half way through staining them when my 4 year old has a lost shoe crisis. No big deal right? Just help him find his shoes, then finish the staining. Here Comes ER visit #2! I go inside, can't find them anywhere and decide to look in the room where my baby is sleeping (and of course he is wide awake and won't let me leave w/o getting him out) so I get him out, find some shoes, and go outside to talk to my neighbor who was taking my 4 year old to the park. About 1 minute later, we hear this coughing, I turn around to see my little one year old Josh coughing with a ring of stain all around his face, and stain pouring out his mouth and all over my porch and him. AHHHHHH!!!! I rush to him, my neighbor calls Poison Control for me, and I try to help him. He is coughing like crazy and trying to throw up. PC tells us to get him to the hospital ASAP, good thing it is only 1 mile from my house! I rush him there, PC has called ahead and informed them I am bringing in a baby who swallowed wood stain, they immediately take him back, get his vitals, then nothing. After all that rushing, I end up sitting in a room trying to keep him entertained, and I wait for 1 1/2 hours! The doctor finally comes in saying that PC will call me 6 hours after the incident to check on him and that I am free to go. Seriously ??? I just payed $50 bucks to have someone tell me to wait for a phone call??? They thought they would x-ray his lungs, but then decided not to, and said to wait a few hours to see if his lungs would start reacting to the stain. I guess if he inhaled any it can cause pretty bad pneumonia, so we are still waiting to see. Personally I think he is fine, thank goodness! The nurses were great and brought him plenty to play with, unlike at primary's! Josh and I getting pretty used to this ER business! I feel so horrible about the whole thing! And now I have a constant reminder stained into my porch concrete of what an idiot I am!!! I twisted some bailing wire around the stems with some needle nose pliers to finish them off. I love them on my shelf wedges in my kitchen! Too bad it is only August, I want to leave them there! Fall will be here soon enough...patience! Cost: Way too much for little wood pumpkins!!! Oh well, at least Josh is okay (number 1 priority), and besides, I still think they turned out great! Moral of the story...don't leave stain out where a small child can get it! And ALWAYS have the # for Poison Control where you can see it! Thanks Michelle! I'm so honored! Wow, the adventure of having young kiddos!! I'm so glad that everyone ended up being 'okay' minus the panic and a few stitches. The pumpkins turned out great!! OH MY GOSH I am so glad that Josh is ok!!!! Scary!! The pumpkins look awesome though... I love them! Loving this craft!! You're so talented! I love your blog and I'm your newest follower! I'd love to invite you to join my link party/giveaway every Friday at FFD! I hope to see you there! PS - glad your little one is ok...awww! What a cutie pie! Well, that's one project you won't soon forget! Glad he's okay! The pumpkins are super cute! Those turned out really cute even with all the ER visits. We all do stupid things. I burned my hand with the hot glue gun while being distracted with children this week. Now I have 3 huge blisters on my hand and have not been able to do much with it since. Glad everything turned out fine. Poor little guy (and mommy too!)! Good to know he's ok! Your pumpkins turned out fantastic! What a story they have to tell, in years to come, huh?! Thank you so much for sharing them with us at Anything Related! I absolutely love these! Great job! Your pumpkins look alot better than the Hobby Lobby ones! I am your newest follower and look forward to reading more of your blog! I'm so glad your little one is okay. He is adorable! Love your pumpkins. You did a great job. I'm a new follower of yours. Pumpkins are super cute. I use the camera on my phone to copy ideas from Hobby Lobby. I am in love with those pumpkins. Seriously. Love them! Don't feel bad about the kiddo drinking the stain. They can get to things even when you are careful. Case in point, my husband when he was a year old. He climbed (yes, climbed!) a shelving unit in the garage, sat on the 4th or 5th shelf, opened a can of paint thinner and started drinking it! My MIL realized that it was too quiet and rushed out there. Mind you, DH has a twin sister. So they had to rush him to the hospital, tried to get him to drink something to dilute the paint thinner. But of course, he wasn't thirsty. So, to the cafeteria for dry cookies. Meanwhile, poor MIL has DH's twin in need of a diaper change and in the middle of all the craziness, she left her diaper bag at home. She had to scour the hospital for a diaper. DH finally drinks whatever it is they wanted him to drink. He was fine. Still the smartest man I know, so it couldn't have killed too many braincells. :) But see, even when they were behind a closed door, on a high shelf, kids can still get into trouble. Wow what a time you have had. The pumpkins are almost as cute as your little one !! Oh, your poor little guy! He's a trooper. I love your pumpkins and featured them on my blog today for some Halloween inspiration. They are too cute!! You have an adorable son, some cute memory photos with a crazy story to last a lifetime, new lesson learned, and cute pumpkins! 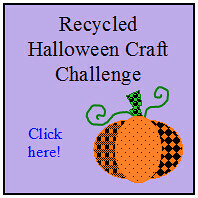 You should enter this in my Recycled Halloween Craft Challenge. They came from wood scraps, right? These are gorgeous! You should make 100 of these to pay off the hospital visits! OR rename your blog the Crafting in the ER! :) Ia m featuring your this project at somedaycrafts.blogspot.com today. Grab my "featured" button. Oh my goodness!! What a story! You poor mommy! It is never fun when our little ones get hurt, and you had to deal with it two days in a row!! I'm so sorry!! The pumpkins could not be cuter!! Fantastic job! Think I'm gonna have to try some of those! You are very, very talented!! I just found your blog. These pumpkins are so cute. You could earn back some of the ER $ by selling the wooden pumpkins, I would buy some! just found this post of yours through somedaycrafts and i am IN LOVE with this project!!! absolutely amazing! i would so badly want to make this!!! Wow! Well your pumpkins turned out great even with the series of unfortunate events! I am glad your little man is okay!! Wowwww!!! What a heck of a story! It's a funny one but I can only imagine how terrified you were - especially after the stain cocktail! OMG! I would have freaked! Now, you will have a reminder every fall when you pull your punkins out to decorate! LOL! Great blog and I'm now a follower! Due to the difficulties in getting the word out about the contest, I've had to make it a requirement that contestants either put the button or a link back to the contest on their blog somewhere. Sorry for the inconvenience. PS: Don't forget that you can enter up to 3 different craft tutorials! Oh my what a story! But I'm glad the little one is ok! What a trooper! The pumpkins, on the other hand... FABULOUS! I would totally buy yours! Very very lovely! Thanks for sharing! I have a one year old who insists on playing right at my feet all the time... makes it hard to get crafts done. I'm so glad he's ok! I LOVE your pumpkins and would buy these if you are selling them... I understand is you never do this craft again after the experience you had! I love your pumpkins. Incredibly cute and well made. Oh my goodness those pumpkins are so cute! Your poor little guy is adorable even with a swollen little nose! VERY CUTE PROJECT! Sorry about the ER! Poor little guy! There is nothing good about the ER. Poor little guy! BUT these pumpkins are fabulous. You did such an amazing job with them. The flourishes on them are fabulous too. Really beautiful. I bet those pumpkins will be truly cherished! I loved the tutorial! I found this through Someday Crafts and added a link back to your blog. I'm glad all is well now.